Day or night, this city is a sight to behold. Pick sides for an epic water fight. Ready, go! A gym this nice is enough to get you to stop making excuses, and actually make a point of going. Not to say you have to, but you most definitely could. You're right on the world-famous Las Vegas Strip, get ready for non-stop excitement. The rooftop pool boasts an incredible view of the city. Relax and unwind with a mud wrap, Swedish Massage or a "Happy Feet" treatment. Check out the most incredible water show, the kids will be amazed. Reach new heights! The High Roller ferris wheel is just a 0.8 mile drive away. There are off-the-beaten-path vacationers, and heart-of-the-action vacationers. If you’re among the latter, thriving on glitz and glamour, Polo Towers by Diamond Resorts is just your style. 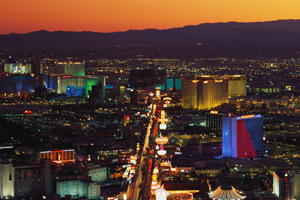 With a prime perch along the Strip, there’s flashing neon as far as the eye can see. Casinos, live shows and unforgettable dining experiences beckon, and succumb, you must. The sophisticated rooftop pool area is a haven of relaxation. So if the bleep-bleeping of the slots has you needing some peace and quiet, you’ll know right where to go. Book a few spa treatments, making the most of your “I’m on vacation” excuse for overindulging with no regrets. Brought the family along? There’s a splash park area to keep the little ones happy. House perks include fitness center access, BBQ area, complimentary valet service, parking and scheduled shuttles to popular venues (so venture out as often as you like – the must-see list here is second to none). The central proximity to all things Vegas makes it easy to head back to your spacious vacation suite to drop shopping bags, stock up on groceries at the onsite mini mart or get spiffy for a night on the town. Vegas is an incredible place for eats, so the fully equipped kitchen may be somewhat irrelevant (especially considering you may snooze right through breakfast). But if you are planning to do some show cooking yourself, both the one- and two-bedroom suites have a fully equipped kitchen. Balcony views are at their peak at night when the Strip shines brightest. Gather with drinks and watch each others’ faces glow every possible shade of reflected neon, then vote on your favorites. Exhausted from a few too many late nights? Room service and DVD rentals make the ideal “recovery night” combo. You’ll be back at it in no time. The concierge is a human Wikipedia of all things Vegas and can point you to the Mirage volcano, Venetian gondolas, Bellagio fountains, MGM lions, Madalay Bay shark reef, Planet Hollywood and much more. Already been there, done that? Ask about Jeep tours, bike and jet ski rentals, horseback riding, championship golf, tennis and “pro” shopping venues. And be sure to get dinner reservations somewhere brag-worthy. - The credit card used to book the reservation must be presented at the time of check-in, along with a photo ID; the name on the reservation must match the name of the guest who is checking in. For more details, please contact the office using the information on the reservation confirmation received after booking. Only registered guests of the resort will be authorized to park on property. Those staying in a studio or one-bedroom are permitted one vehicle, and those in a two- bedroom are permitted two vehicles. No exceptions will be made during this time. At check-in, a parking pass sticker will be provided. Replacement passes will be at management’s discretion and based on circumstances, and may be denied.